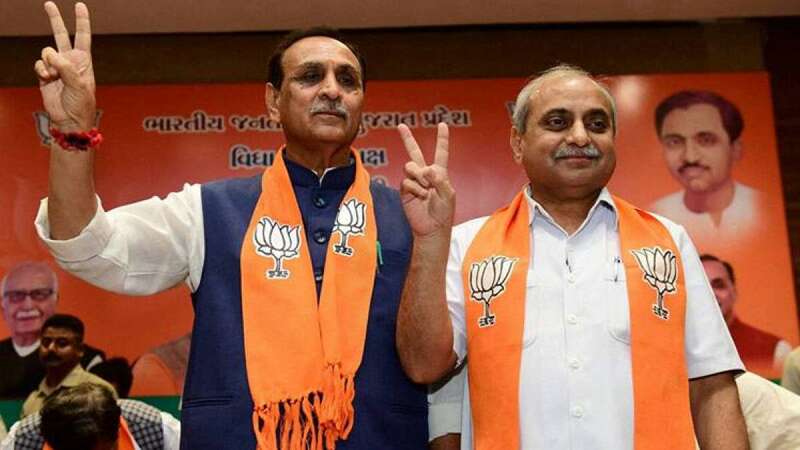 Gandhinagar : Vijay Rupani and Nitin Patel are widely expected to continue as Gujarat's Chief Minister and Deputy Chief Minister after the BJP retained power in keenly fought elections but some others are said to be eyeing the top post. Among those wanting to take Rupani's place are ministers from Gujarat in the Narendra Modi government, party sources said on Wednesday. The Bharatiya Janata Party (BJP) in all likelihood will want Rupani and Patel to hold on to their posts until the 2019 general election. The source said Rupani was an acceptable face in the party and the BJP did well in the just ended Assembly elections in his home district. But there are grievances against Rupani and Patel, with the BJP seat tally not touching even 100 - compared to BJP President Amit Shah's repeated claims that it will win 150 seats. Among those said to be wanting to be Gujarat Chief Minister is Union Minister of State for Agriculture Purshottam Rupala, who has a good standing in the Patidar community. The others are union minister Mansukh Mandavia, another Patidar, and Rajya Sabha member Smriti Irani. The swearing in ceremony is likely to be held on Christmas Day and the most likely venue will be the Sabarmati riverfront.